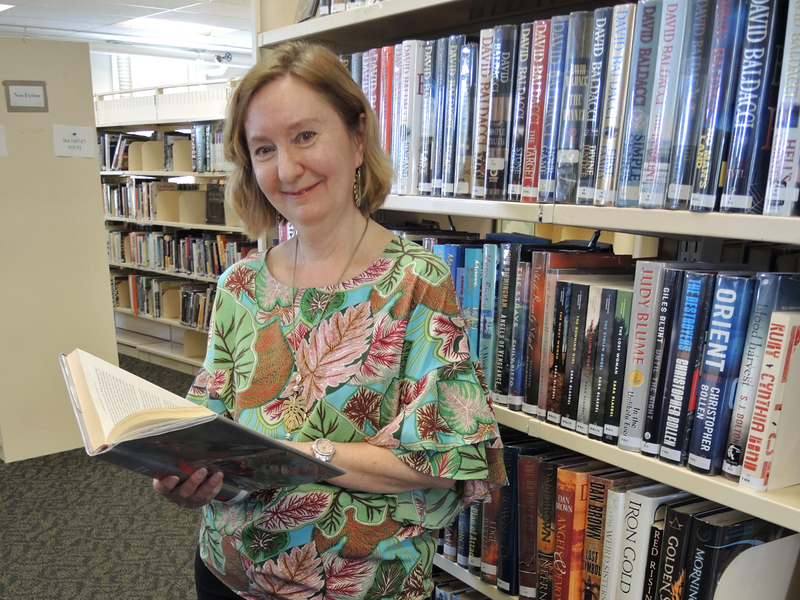 Base librarian Sheryl Irwin is about to turn the page to the next chapter of her life story, retirement. On April 17, Irwin will officially end her 35-year career in Canada’s public service. She will say goodbye to her co-workers and friends with a small farewell lunch at a local restaurant. Two weeks before Irwin’s departure, the Base library will close its doors for good. The library, which occupies Naden’s building 12, and three other structures located in the immediate vicinity are being transferred from the Department of National Defence (DND) to Public Services and Procurement Canada. Irwin, 57, had worked for the Federal Government prior to becoming the librarian, mostly performing secretarial and clerical duties at various military installations across the country and once in Baden, Germany. She took on the job of head librarian in 2001. Being a divorced, single mom kept busy with work and raising two children, full-time attendance at a post-secondary institution was impossible. So, Irwin did the next best thing and enrolled in an online course, obtaining her qualification over four years through the Nova Scotia Community College. Over the years, she has prided herself on promoting the library and keeping its collection relevant and perhaps even a little bit eclectic. She notes that despite the library’s small size, resembling a small post-war house, its military section is particularly strong and comparable to much larger facilities. But Irwin admits that as the years rolled by and the prevalence of digital technology mounted, the appeal of reading print had lost its draw for many people. An agreement for the transfer of property between Base Administration to Real Properties Operations Section (RPOps) Esquimalt was initially reached on April 1, 2017, setting in motion the wheels that led to its closure. That agreement stipulated the library would remain open until the retirement of its librarian. Kelli Mullally, Deputy Base Personnel Services Officer, assisted in the land transfer project to RPOps and says the identification of library resources that are “particularly meritorious” or have great “historical military or naval significance” is on-going. With the library set to be shuttered, Irwin, with the help of a casual librarian, will be kept busy finding permanent homes for the books at various units on the base and organizations off base. Some items will temporarily be kept in large shipping containers located in Colwood as they are distributed to various units and libraries on the base, some books will be sold, and some donated to community partners, particularly the Greater Victoria Public Library. Mullally says a form of recreational library or reading room is also being considered for the future Junior Ranks accommodation facility. Irwin says she has already arranged to spend some of her retirement time volunteering for the children’s urban agricultural non-profit Growing Chefs. She fully believes in their message to bring gardening, food nutrition, and local growers into schools.